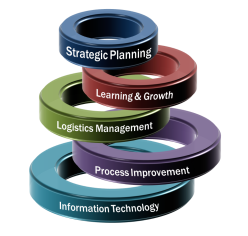 We are a Management Consulting Company with core competencies in Strategic Planning, Learning and Growth (Training), Logistics Management, Process Improvement, and Information Technology. At Allons we have an unparalleled depth of both functional and industry expertise as well as breadth of geographical reaches. Our scale, scope, and knowledge allow us to address problems throughout the full spectrum of your enterprise. At heart, we are a network of people who are passionate about taking on immense challenges that matter to leading organizations, and often, to the world. We help management make the big decisions: on strategy, operations, technology and organization. With the added strength of our strategic partners, Allons has the ability to offer a true global, integrated approach to business issues that combines insight and innovation from multiple disciplines with a wide range of business and industry knowledge – help organizations excel anywhere in the world.